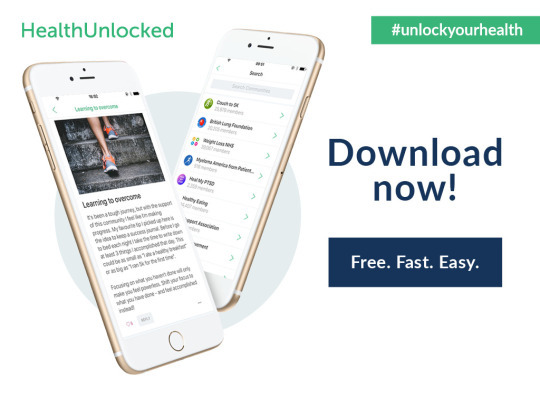 We have a very exciting announcement on our blog today… the launch of our first ever HealthUnlocked app. More and more people are turning to HealthUnlocked for support and help and we all know that managing our own health has never been so important. We wanted to make this as easy as possible, which is one of the reasons we have been developing a new app for iPhone. The app, which is based on feedback from our users around accessibility on the go, brings all the benefits of the website into one place. As with the website, it is free to use (and download). Essentially, you can join and visit communities, follow others, write posts, upload images, search for content, private message, write and respond to posts, and more. We’ve been working on this app for a while, getting people to test it and ensure that the technology is right, before working on it further, just to make sure it’s as good as it can be. This week we are delighted to have given it the green light and put it into the app store. This is a real game changer for some people as access will be easier than ever before. You can sit on your sofa, on the train or in a waiting room and to see what others in your same health situation are experiencing.. When others interact with anything you’ve done you’ll be notified by the app. It also allows people to sign up from the app and we hope this will bring even more people to HealthUnlocked to share their own experiences of their health conditions. We are really excited about this and the difference the help and support it will make to people’s lives. We hope you like it as much as we do. Download it from the iPhone Apple App Store [LINK} and please do tell your friends about it. It is currently only available in the UK, but we will be rolling it out further shortly. Please do let us know what you think, give it five stars on the app store, and tell us how you find it on our latest news community. If you have any questions about it you can also post them within this community. Available for use on iPhone the app can be downloaded from the Apple App store. Previous Entry Last day of sugar free February. How did you do?